Portable car jump starters are extremely handy emergency use devices for car or truck owners. usually if your car’s battery dies (i.e. its charge falls too much below operating voltage), you have to call in roadside assistance guys or hail passing vehicles and jump start your vehicle. 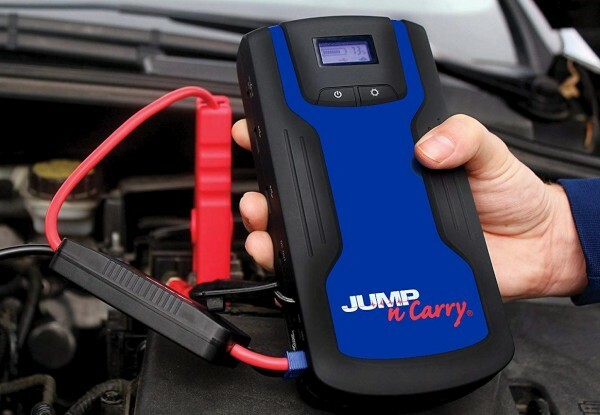 With a portable car jump starter, you can start your car yourself within minutes. Portable car jump starters are therefore an essential piece of emergency equipment to carry in your car. Portable car jump starters use batteries and this allows them to be used as emergency powerbanks as well. Lithium-ion batteries retain their charge for months and this makes Li-ion based car jump starters excellent emergency use powerbanks as well. Just remember to not deplete the batteries too much. It is best recommended to use your car jumps starter to charge your phone only when absolutely necessary so that your jump starter does not run out of battery or sufficient start attempts) in emergency situations. When evaluating car jump-starters, there are many many important not so obvious must-haves to consider that do not apply to regular powerbanks. One of these is audible reverse polarity alert. This alerts you if you put the jumper clips in wrong order. Similarly high quality jumper clips are absolutely essential as well. Another important criteria are starting Amps. We considered 350 starting Amps (700 peak amps) to be the absolute minimum required for reliably starting vehicles with seriously discharged batteries. This was one main reason why we rejected reputed powerbank maker Anker’s PowerCore Jump Starter. RAVPower’s jump starters also did not meet our criteria as well. Both Anker and RAVPower are excellent powerbank makers but car jump starters are a different ball game and a car jump starter first and foremost must be a good jump starter – the use as powerbank is secondary and hardly relevant. Reliable and repeated jump starting and retention of charge for long times are other important criteria. We have carefully put together our list of car jump starter powerbanks that satisfy all our criteria. While there are many temptingly low-priced options available in the market, in terms of reliability, build quality as well as features, we found Clore JNC318 Jump Starter to be the overall best Li-ion battery portable jump starter powerbank for passenger vehicles. While Clore JNC318 Jump Starter may not have the maximum amps or the most bells and whistles as the much more expensive jump starters, we found to be reliably effective in jump starting both gasoline and diesel vehicles including V8 engine pickups without fail. Clore JNC318 has many nifty features as well. One of these is its excellent built in digital display that shows remaining battery accurate to 1%. Another great utility feature is that it comes with a 12v female outlet, which can be used to power devices such as inflators. Many others sell the 12V outlet separately. Another very handy feature is the pre-heat mode for starting the vehicles in freezing conditions. The preheat mode takes just 2 minutes to warm the battery to usable levels and is a must have feature for almost half of the US (and entire Canada). Clore JNC318 Jump Starter also has inbuilt bright LED flashlights complete with Strobe/SOS feature for emergency use. The in built 18000 mAH battery is adequate for almost 30 start attempts at full charge. Clore JNC318 Jump Starter has two USB outlet ports with 2.1 amp max current. This enables it to fast charge both Android phones and iPhones. The rugged build quality is reflected in the quality of jumper clips as well though the cable wires are 10ga (8 gauge would have been better). Clore JNC318 Jump Starter backs this product with great customer service and warranty and this seals the deal. Clore JNC318 Jump Starter comes with its own power brick which charges it fully in 2 hours. Adequate 18000 mah battery capacity required for multiple attempts. This is adequate for almost 30 attempts. Large battery makes it great for use as an emergency powerbank. Two fast charging 2.1 amp USB ports for charging smartphones. 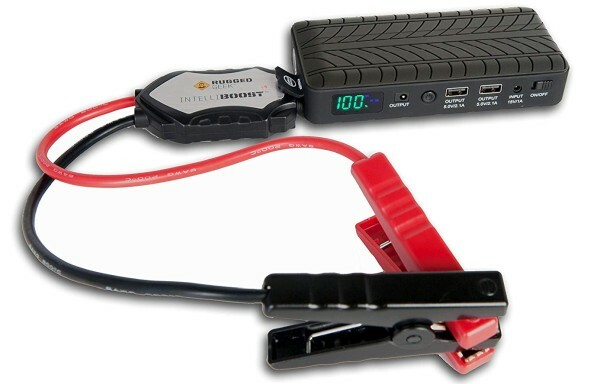 Rugged Geek RG1000 Safety 1000A Portable Car Jump Starter is our next favorite pick. Rugged Geek RG1000 can not only deliver adequate 1000 Amp peak current but it also comes with lots of features and accessories that make it an excellent emergency use powerbank. Rugged Geek RG1000 weighs just about 1 pound making it the lightest Jump starter powerbank in our picks. It is also the smallest with dimensions of 6.3 x 1.3 x 2.9 inches. However, despite its small dimensions, it can deliver an incredible 1000 amps peak current, which reliably starts almost all passenger cars and SUVS. Once charged, Rugged Geek RG1000 will retain almost 80% charge after 1 year, making it a charge once and forget emergency use device. 10,500 mah battery capacity is enough for 20 starting attempts. 10,500 mAH battery is decent for emergency use as a powerbank. One full charge of Samsung S9 or S8 will use up almost 40% of the battery, still leaving you with about 12 start attempts. 1 lb weight is great! NOCO Genius Boost Plus GB40 1000 Amp jump starter is our #2 choice as a jump starter powerbank. NOCO Genius Boost Pluss GB40 can deliver an incredible 1000 AMps peak (500 amps starting current) which is adequate to start any passenger vehicle – gasoline or diesel. 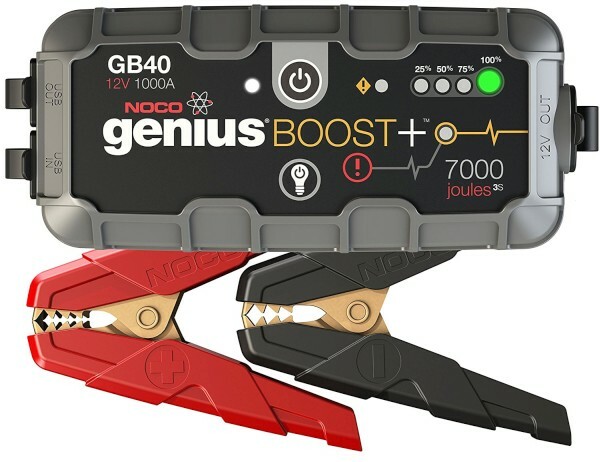 While NOCO Genius Boost Pluss GB40 excels as a car jump starter, it also lacks certain convenience features which have made us place it below our #1 pick. Its biggest shortcoming is its puny 6400mah battery which is just enough to charge a modern smartphone with spare power remaining for 5-6 sump start attempts. On the other hand it boasts certain incredible features that make it stand apart. For example, it can start your vehicle even if your battery voltage level has fallen below 2 volts!! Most car jump starters cannot start below 9 volts! For batteries that are even more deeply discharged, NOCO Genius Boost Pluss GB40 even has an manual override feature that lets you override the reverse polarity protection features and deliver powerful 1000 Amps current to wake up deeply discharged batteries. 6,400 mAH internal battery is barely adequate for charging smartphones. Charging one smartphone such as Samsung S8 or S9 will deplete almost 70% of the battery, leaving the user with just 6-7 starting attempts. This essentially means that Noco Genius boost is best used as an emergency powerbank for topping of the battery for emergency use. Priced higher despite having 1/3rd the battery of our #1 pick.